Haugesund Stadion officially opened on 17 May 1920. The ground was built by the council and initially shared by three local football clubs. The ground was first nothing more than a bare gravel pitch and some changing facilities, and it took until 1926 for the first stand to be built. The stadium got further expanded in the 1930s and 1940s. Haugesund Stadion set its record attendance in 1961 when 17,000 spectators attended a match between Haugesund and Steinkjer. Over the years, the stadium remained a basic structure with an athletics track and little cover. In the mid 2000s, Haugesund explored the option to build an entirely new stadium, but in the end opted to renovate Haugesund Stadium. Redevelopment works were performed in 2012 and 2013 and included the removal of the athletics track and construction of new stands, including a new main stand. 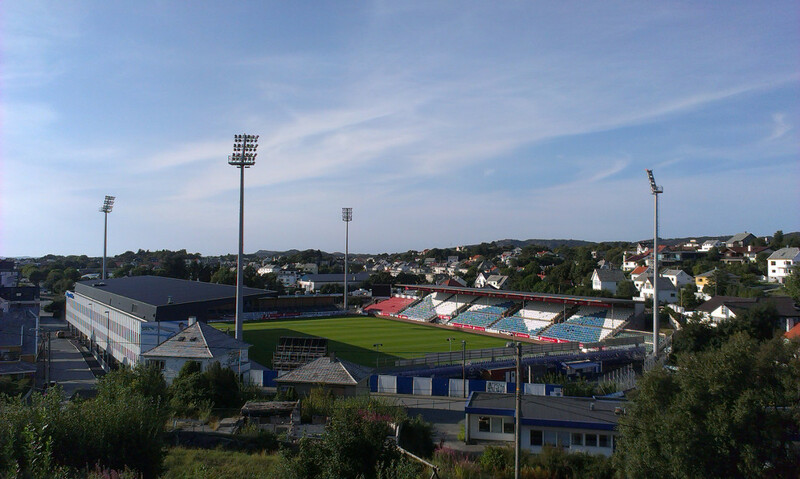 Haugesund Stadion is located on the western edge of Haugesund’s small town centre. It’s only a 5-minute walk from Haugesund’s main shopping street, Haraldsgata, in the town centre. Haugesund’s bus terminal lies just north of the stadium, again not more than 5 minutes walking away. There are frequent buses to Bergen (3 hours) and Stavanger (2 hours), and somewhat less frequent to Oslo (8 hours). Haugesund doesn’t have a train station. Haugesund’s airport lies about 13 kilometres south of Haugesund. There’s a daily service to Oslo and a further few flights to a few international destinations. Haugesund Stadion lies right on the edge of Haugesund’s city centre, which means there are plenty of restaurants and bars at short walking distance, even though Haugesund remains a rather small town with modest entertainment possibilities. There are neither a whole lot of hotels in Haugesund, but the ten hotels that are there should be enough to choose from, and most are at easy walking distance from the stadium. Click here for an overview of hotels in Haugesund. Tickets for Haugesund games can be bought online (print@home or mobile ticket), or at the Macron sports store at Karmsundgata 178 a block away from the stadium. Tickets can also be bought on the day at the stadium. Haugesund doesn’t sell out too often, but buying in advance is recommended for high-profile games. Tickets cost NOK 200.00 for a seat behind the goal or either NOK 260.00 or NOK 280.00 for a seat at one of the sides. Fkh.no – Official website of FK Haugesunds. Visithaugesund.no – Haugesund tourism information.